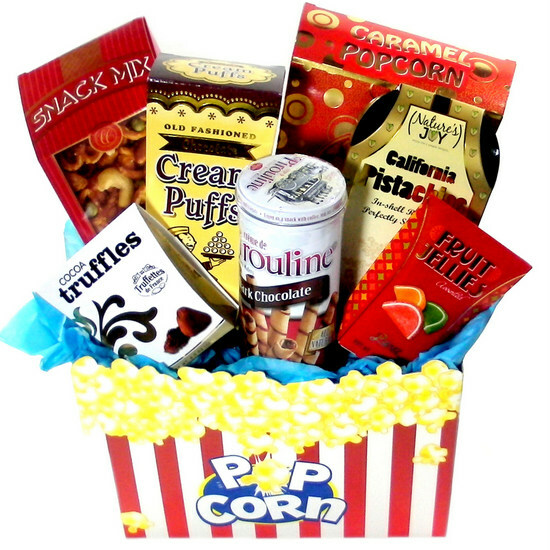 Popcorn gift basket. Striped red and white with popping image and popcorn word printed on the box. 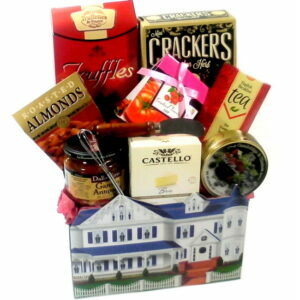 A fun gourmet food gift basket filled popcorn, snack mix, candies cookies and chocolates. Basket contains: Caramel popcorn. Snack mix. Old fashioned chocolate puffs. Pistachios. Fruit jellies candies. Pirouline dark chocolate cookies in tin and French chocolate truffles. Gift great for any occasion Get well. Birthday. New Home. and much more.